Small ivory fragments were also found with the Drake cache. Dennis Stanford of the Smithsonian Institution began his investigation of the Drake site late, after it had already been well searched. But he did recover a hammerstone and more ivory fragments similar to the ones that had already been surfaced collected. The ivory fragments may have been foreshafts for Clovis projectile points or maybe even handles for Clovis knives. 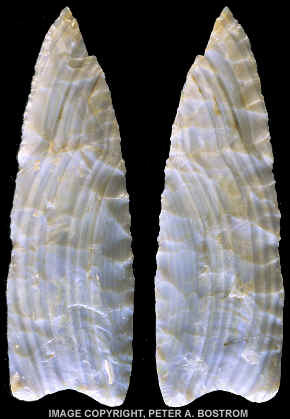 This Clovis point was found on the Drake Clovis site in north central Colorado. It's made of a beautiful piece of blue striped Alibates agate and measures 4 1/2 inches (11.4 cm) long. The oldest recognized culture in North America is Clovis and, as would be expected, caches from this early period are rare. Only seven examples from the western states have been scientifically described. The Anzick cache from Montana is the largest with 100 pieces. The five other caches, besides Drake, are Fenn (unknown provenance--either Utah or Wyoming, 1902?) Simon cache (Idaho, 1961), Busse cache (Kansas, 1963), Crook County cache (Wyoming, 1978) and the Richey cache (Washington, 1987). A Clovis cache that was found in the eastern U.S. is the Lamb cache (New York, 1965). 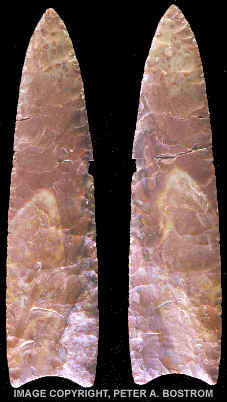 This Clovis point was found in the Drake cache. It's made of Alibates agate and measures 6 17/16 inches (16.3 cm) long. Prehistoric caches of two or more stone artifacts are commonly found in North America. Most of them are discovered by the general public in a number of different ways. Caches are found by farmers who plow their fields, construction workers who build buildings & roads or even by fishermen who walk along eroding stream and river banks. In-other-words they can be found anywhere the ground has been disturbed by man or nature. 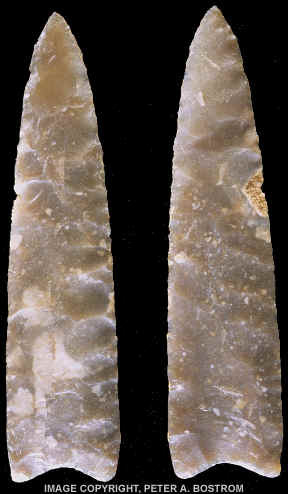 This Clovis point was found in the Drake cache. It's the only one in the cache that was made of Edwards Plateau chert. It measures 5 7/8 inches (15 cm) long. Anzick is one of the few Clovis caches that contained organic material and the only one that seems to show good evidence for the purpose of the cache. The Anzick Clovis cache from Montana was found with a child burial. In this case the artifacts seem to have been left there as offerings to the dead, as grave goods. 1990, Yeager, C.G. editor, "History of the Stone Age Fair" pages front cover& back of front cover. 1991, Stanford, Dennis, Clovis Origins & Adaptations, "Clovis Origins & Adaptations: An Introductory Perspective", p. 3. 2001, Chandler, James M., Mammoth Trumpet, "Lithic Caches", 9 pages. 2002, Weinmeister, Garry, Indian Artifact Magazine, "The Drake Clovis Cache", pp. 50-52 & 80.